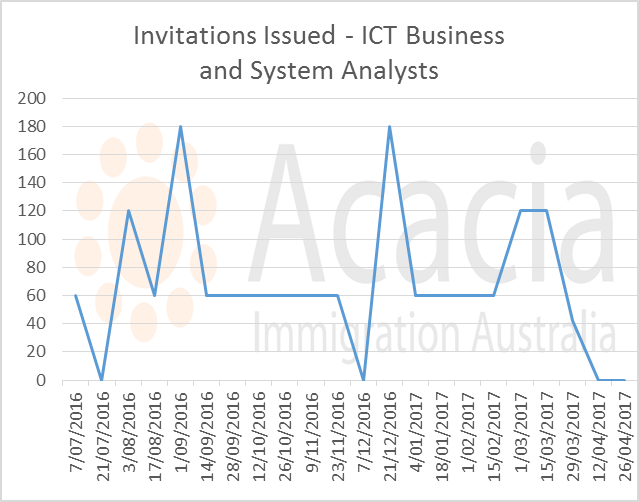 All pro rata occupations have now been filled for the 2016-17 program year - these occupations will not be available for Skilled Independent Subclass 189 invitations or Skilled Regional Provisional Subclass 489 (family sponsored) invitations until 1 July 2017. This article looks at the trends for the current program year, and looks at the likely prognosis for the next program year. 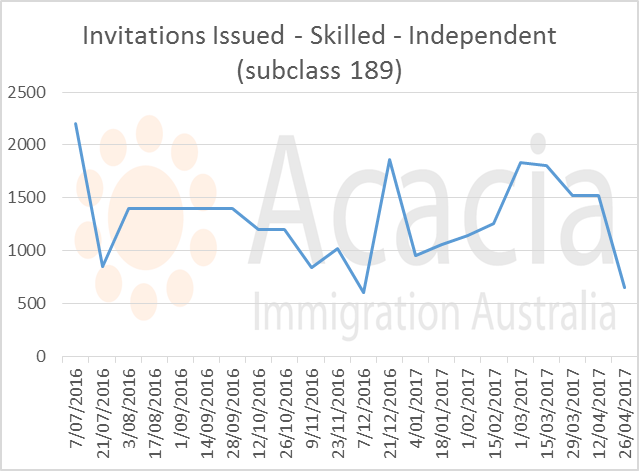 The minimum score required for applicants to receive an invitation for a Skilled Independent Subclass 189 Visa for non pro-rata occupations has been 60 points for all invitation rounds so far in 2016-17, apart from the 1 September round. For most of the year, applicants with 60 points have received an invitation in the next invitation round. The number of invitations issued for the 189 subclass varied considerably for the program year. 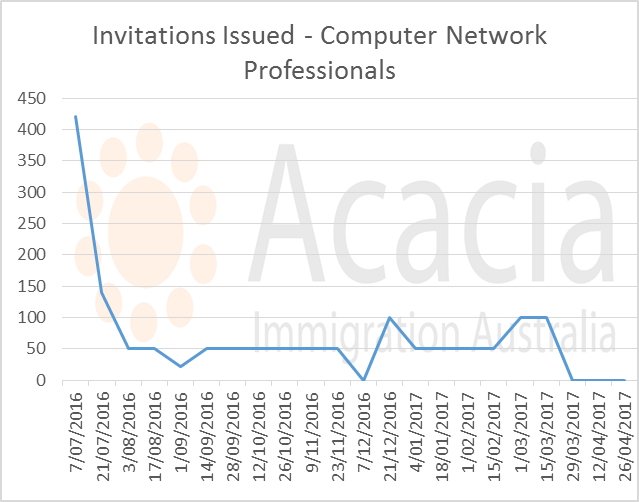 In the 7 July round, 2202 invitations were issued, with a low number of 606 issued in the 7 December 2016 round. 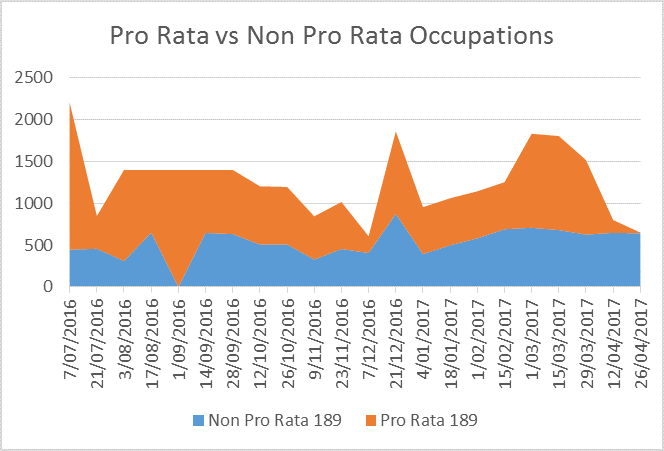 When we look at the number of invitations for pro-rata occupations vs non pro-rata occupations, it becomes apparent that most of the variation in numbers is due to the pro rata occupations. 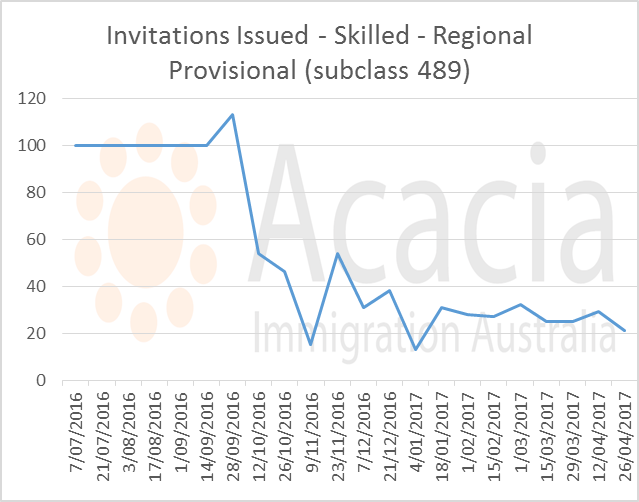 There are generally 400-700 invitations for non pro-rata occupations, with a peak in December which is likely due to international students completing their courses. 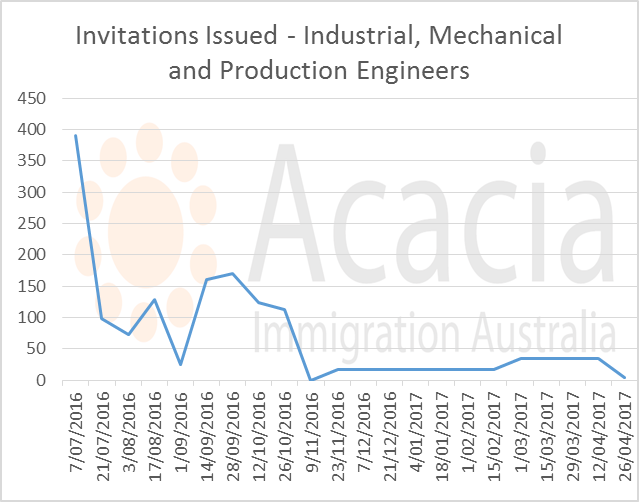 The number of invitations for pro rata occupations fluctuates more. There are peaks at the beginning of the year which occur because the occupation has not yet been placed on the pro rata list. 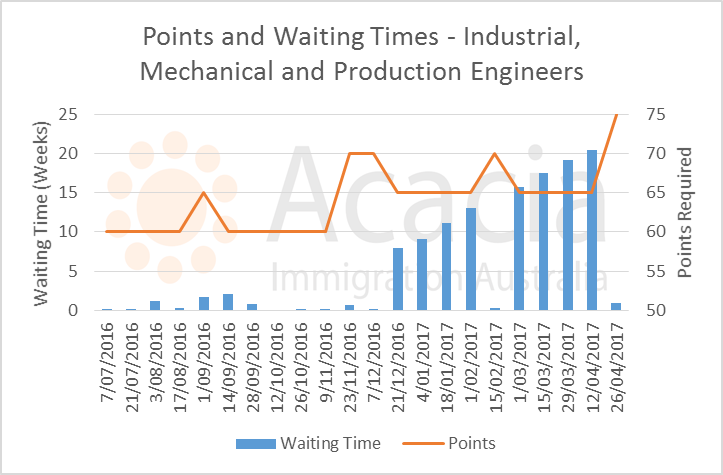 There were also peaks in March-April when the Department of Immigration was inviting at double the usual rate for pro rata occupations in an attempt to meet migration program numbers. There were 8 "pro-rata" occupations- these are occupations where there are more EOIs lodged than can be accommodated in the occupational ceiling. For these occupations, the number of invitations issued in each round is limited so that the ceiling is not filled too quickly. As a result, the minimum points required for an invitation may be higher or the waiting time longer for an invitation. 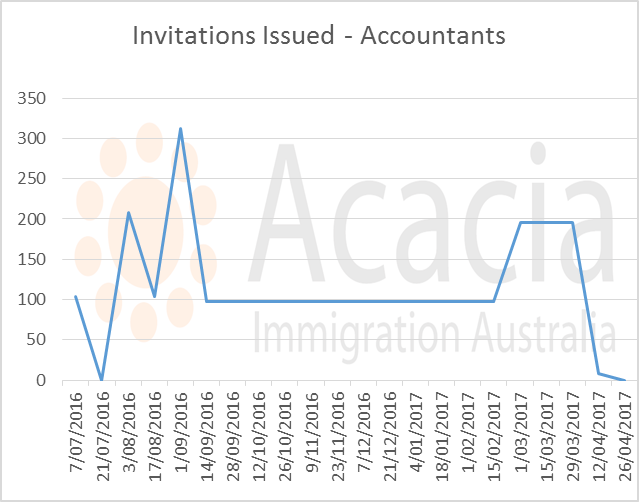 Accountants were on pro rata status from the beginning of the program year, eventually settling on a number of 98 invitations per round. Minimum score required for a 189 invitation was 70 points for the entire year for accountants. Last year, there were some rounds where accountants were invited on 65 points. 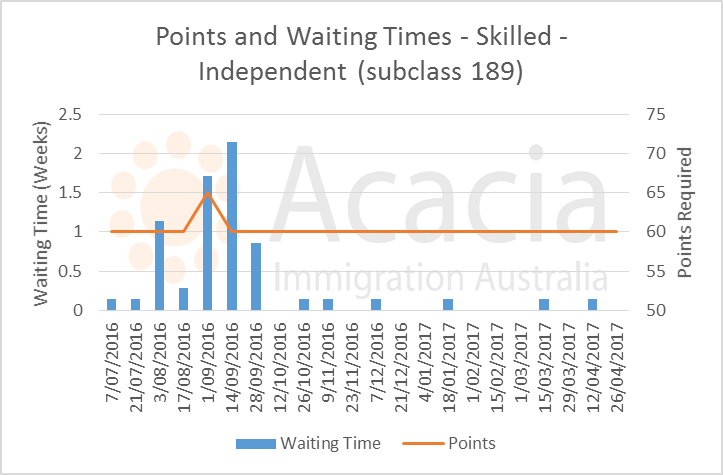 Waiting times for a 189 invitation varied - at one point applicants were waiting 22 weeks for a 189 invitation with 70 points. 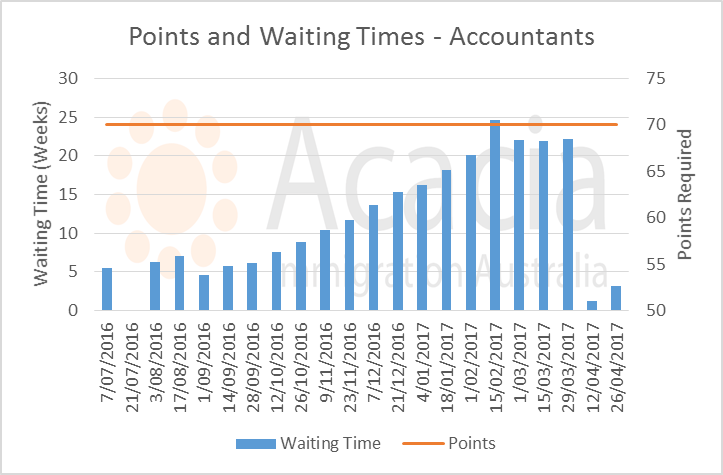 This suggests that unless the occupational ceiling is increased in July, then accountants will still require 70 points and that this may increase to 75 points. 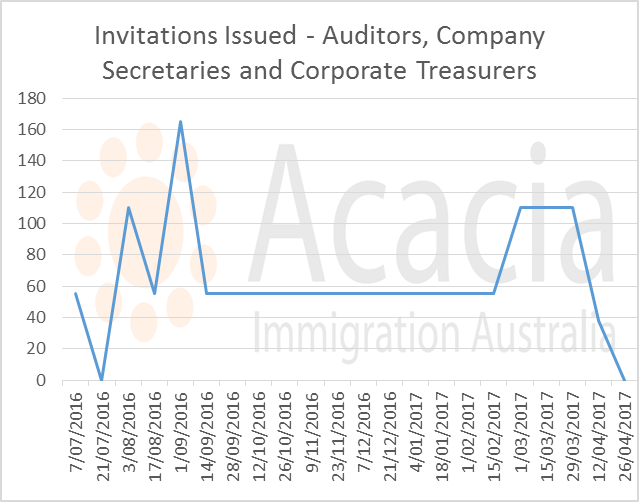 Auditors were pro rata for the entire program year, with 55 invitations issued in most rounds. 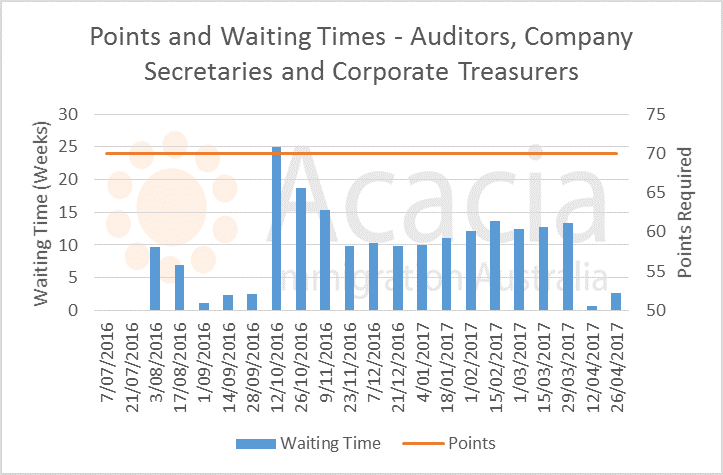 However, waiting times for auditors were slightly better than for accountants - the maximum waiting time was 13 weeks with 70 points. 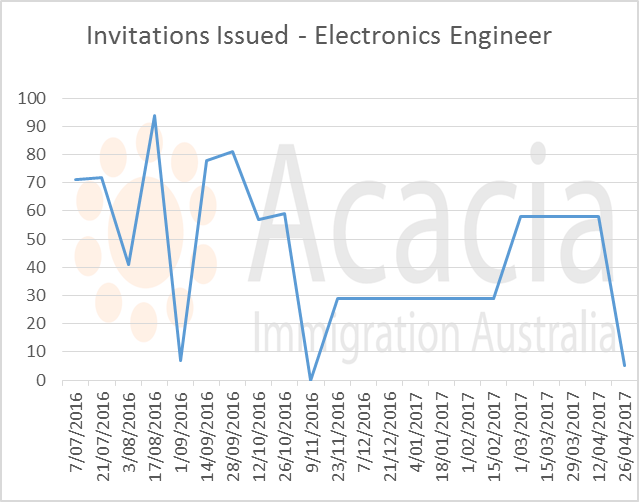 Initially, 70 points were required for a 189 invitation, but this quickly reduced to 65 as the backlog of EOIs at 70 points was cleared. Waiting times got up to 30 weeks, so we expect this to be a competitive occupation in 2017-18. 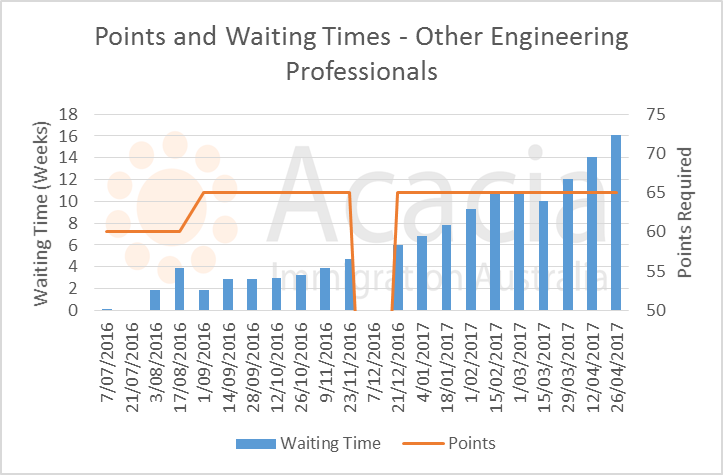 If the occupational ceiling stays the same next year, it is quite likely that the required points for a 189 invitation will be 70 points for several invitation rounds, before settling back to 65 points. Also pro rata from day one, 230 or 225 invitations were issued for most months. Minimum score was 65 for the entire year, and waiting time gradually increased at this score, but was still only 5-6 weeks for most months with this score. We expect this occupation to still require 65 points in 2017-18, assuming no major change to the occupational ceiling. This occupation was not immediately put on pro rata status, with the result that large numbers of invitations were issued in the first two rounds. Eventually, this settled down to 50 invitations per round. Initially, 60 points were required for a 189 invitation, and this soon increased to 65 points. We expect the minimum score to be 65 points in 2017-18. This occupation was not changed to pro rata status until 23 November 2016. The pro rata rate was 29 invitations per round. 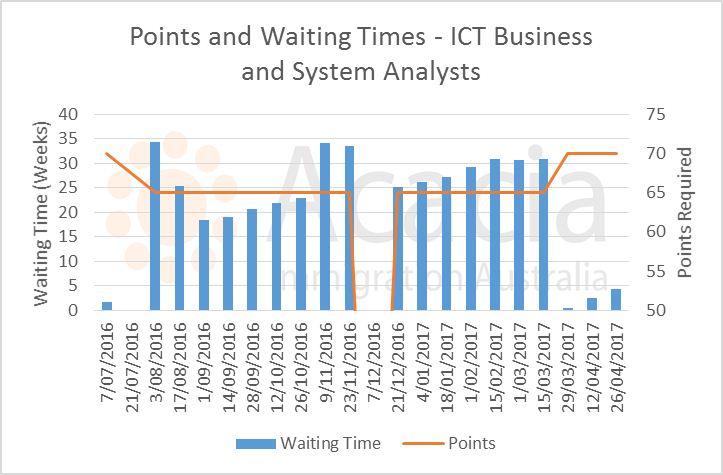 60 points were sufficient for most of the year and waiting times were short. The points required went to 65 for a few rounds in November/December, but quickly went back down to 60. In 2017-18, we expect 60-65 points will be required for this occupation - it may not be placed on the pro rata list immediately. This occupation was not changed to pro rata status until 23 November 2016. By this time, most places had been allocated and so only a small number of invitations were issued per round - 17. 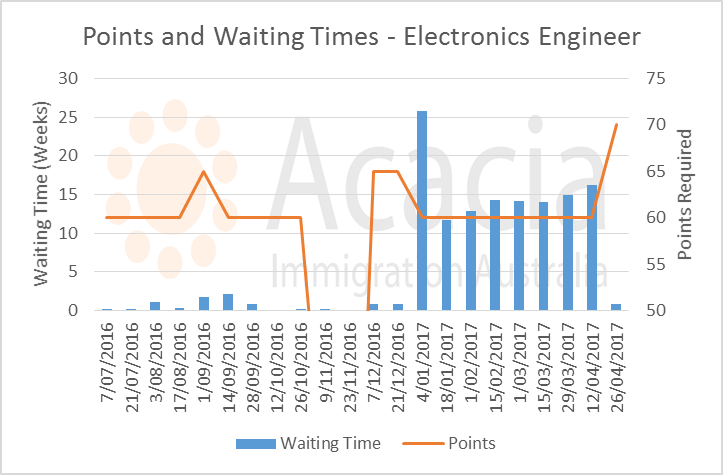 As a result, until November 2016, 60 points were sufficient and waiting times were short. From November, due to the low number of available places, the minimum score went to 70 but then down to 65. 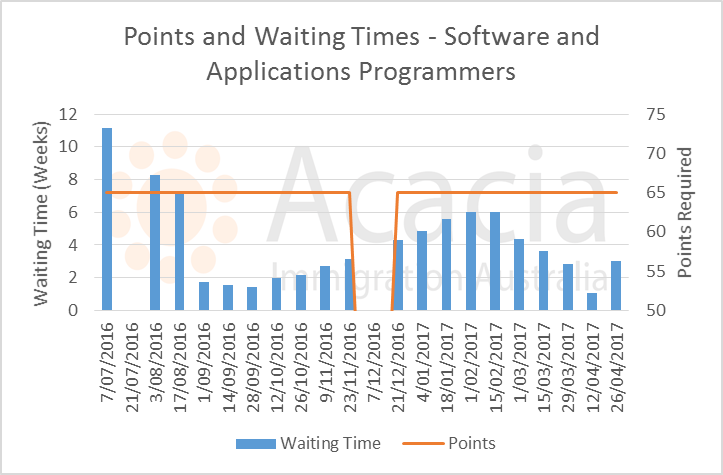 Waiting times at 65 points got up to 20 weeks. We expect this occupation to require between 60 and 65 points in 2017-18, and expect it to be on the pro rata list a lot earlier than this year. This occupation includes Engineering Technologists, Aeronautical Engineers, Agricultural Engineers and Biomedical Engineers. The occupation was not pro rata for the first two rounds, resulting in a high number of invitations being issued at 60 points. 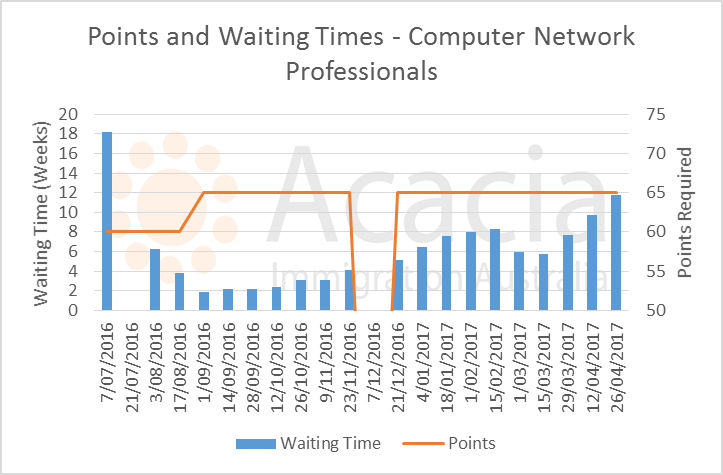 Points required quickly went to 65, and due to relatively low numbers of invitations available (28 per round), waiting times increased to 10 weeks. In 2017-18, we expect this occupation to be pro rata from the beginning of the year, and 65 points will be required, assuming a similar occupational ceiling to the 2016-17 year. The number of invitations issued to family sponsored 489 applicants has increased significantly as compared to the 2015-16 program year. 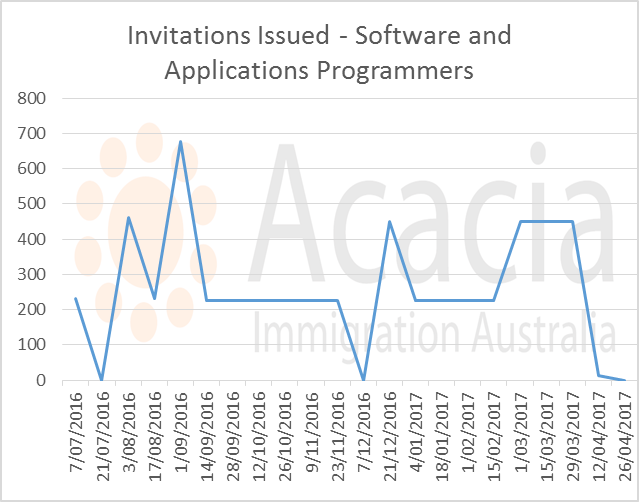 Initially, 10 invitations were issued per round - this quickly used up the backlog of applicants at 65 and 60 points. By the 12 October round, the backlog had been used up and the number of invitations per round started to fall to a steady 25-30 per round. Minimum points required for the 489 family sponsored program started at 65 but quickly reduced to 60 points. Applicants with 60 points would expect an invitation next round. The future of the family sponsored 489 program is not clear for 2017-18. 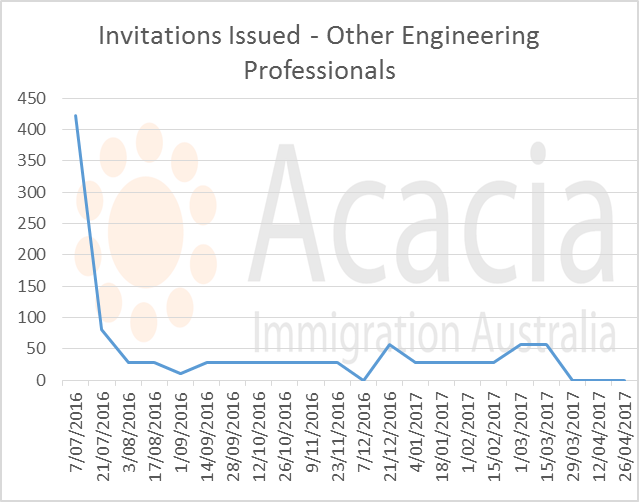 Because the 189 is prioritised for invitations over the 489 family sponsored program, it is very unlikely that someone with a pro rata occupation will receive a 489 invitation. 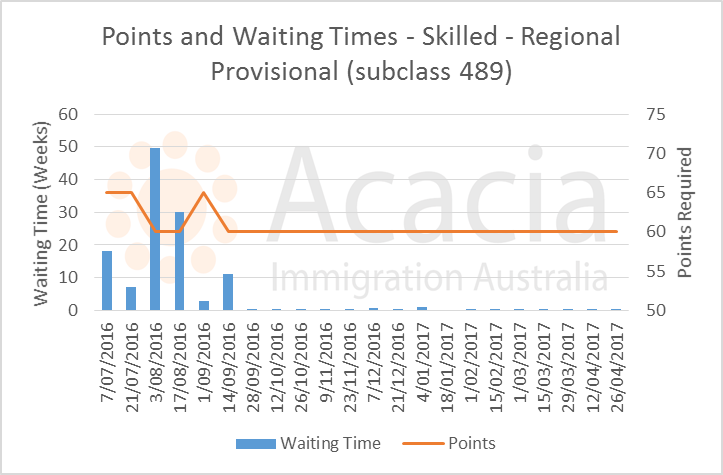 If the Department of Immigration sees it as a good way to increase General Skilled Migration options, they could exclude the 489 program from the occupational ceilings. This would result in much higher numbers of invitations in pro rata occupations. Otherwise, we expect it to contribute low numbers in 2017-18 - with 25-30 invitations per round and 60 points required. General Skilled Migration is getting more competitive. In 2016-17, there were more occupations on the pro rata list. Required scores for these occupations were higher than last year, and waiting times longer. New occupational ceilings are likely to be announced in July 2017. If these stay the same, certain occupations are likely to get more competitive - particularly for accountants and auditors. As pro rata occupations will be ineligible for invitations for several months, we expect a backlog to build up. This may result in some occupations being more competitive than usual in the beginning of the program year in July 2017. The future of the family sponsored 489 pathway remains in doubt - the current prioritisation of the 189 program over the 489 program means that numbers are low. As soon as we know more about the program settings for 2017-18, we will publish more information via the newsletter.